Have you ever had a hard time seeing the value of your marketing efforts? Have you ever found yourself in a debate about lead quality between sales and marketing? These are common problems for many businesses. Let me introduce you to Michael Cooney. In a recent interview with him, he has some solutions for you. David: Thank you, Michael. I’m calling on you today as an expert in lead attribution. I know that this is a passion of yours. If someone could only do One Thing to help their online marketing efforts this month, what should they do? 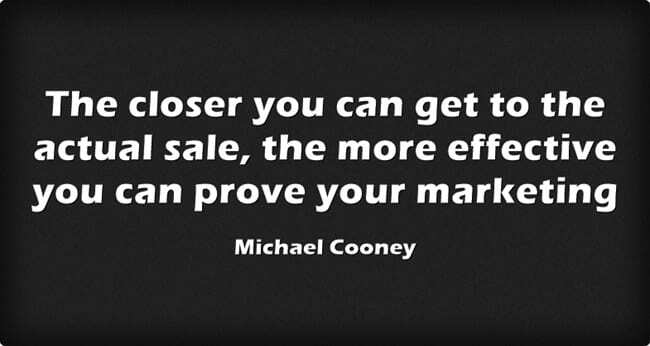 Michael: Somebody once told me that in marketing the closer you can get to the actual sale, the more effective you can prove your marketing. Unfortunately, there’s often a barrier between marketing and what happens to the sale. We can only go so far. Don’t just rely on evaluating your marketing based on clicks. Clicks are good. Visitors are good. These are great indicators, but that’s all they are- they’re general indicators. Instead, pay particular attention to leads and the quality of those leads. Yet even the number of leads is just an indicator of effective marketing. We tested different marketing channels for several businesses. At the end we found that marketing campaign X generated 10 leads this month. That came to $50 per lead. That’s a good starting point. We’d try another marketing campaign. That also generated 10 leads for about $40 to $50 a lead. When we looked deeper we found that it wasn’t a good gauge on how much business did that actually generate. So what we started doing is tracking each individual lead. We put in a system. It actually became a product called WhatConverts. Our system ties individual leads back to the original marketing source. So, now, at the end of the month you could look at the individual leads and see which of those turned into a quote and which became a sale. Then you would know what campaign delivered you not only 10 leads but 3 quotes and 1 of those quotes became a sale. When we started doing this, it changed the way we thought about our campaigns. For instance, one campaign was generating 10 leads a month. When we looked deeper we discovered that 8 out of those 10 were solicitations. They weren’t actually leads at all. People were filling in the form or calling in, but they were trying to sell to our clients. So at that level we were able to say, “Okay, we’ve got two marketing campaigns. Both of them generated 10 leads. One was mainly solicitations and not relevant leads.” Once we knew the low quality of the leads we could cut that campaign. Before, we didn’t have a clue. We just knew that each campaign generated 10 leads. David: I’d love to have that information! This way you could spend your marketing dollars much more efficiently. Michael: Once you have access to the data, it’s pretty mind blowing. One of the insights I discovered is from Google Organic referrals. Google is the 800-pound gorilla from leads generated and visitors to your website point of view. Nobody pays much attention to Yahoo and Bing. Once we saw the data we found that Google generated five times more visitors to the website. They actually generated 4 to 5 times more leads than Bing and Yahoo. But the conversion to actual quotes from Bing and Yahoo was higher than Google. So the difference, it wasn’t 5:1 anymore. Now it was more like 3:1. We discovered that Yahoo and Bing were actually more valuable than we expected. When we considered the quote value of our leads we found there that the gap closed even further. We were getting valuable leads from Yahoo and Bing, that previously we were discounting. Another insight was the difference between organic and paid traffic. So let’s say Google AdWords compared to Google Organic. So Google Organic typically brought in more leads by quantity. When we looked at actual quote value we found that the AdWords quote value was higher. David: Was the same true for other marketing channels, besides search? Michael: Yeah, email newsletters. Email newsletters are difficult to track the value. We have a customer that’s been doing newsletters for two years. Every time he sends it out we’re able to track specific leads back to the newsletter. They almost doubled the repeat sales using a company newsletter. David: If I was a company, I’d want to make sure I’m not just generating quantities, but quality. I’ve seen it before: sales blames marketing for not delivering quality leads; marketing blames sales for not following up with lead. The CEO is caught between the sales and the marketing. The ability to track a closed sale to where the lead came from will help a CEO understand what’s going on. Michael: Sometimes salespeople like to point to the low-quality leads, even though it could be their fault. When you record phone calls, it can solve some of this. Then, when someone says the leads are junk and are not working. You can suggest they listen to the phone calls. You might find out that salespeople aren’t doing a great job. I remember this one case where the salesman answered the phone. The customer says, “I’m looking at this $5,000 piece of equipment.” The salesman sighs and says, “Yeah, five grand.” The customer says, “Um… Okay. What’s included in that?” You could just tell the salesperson had no interest in helping at all. He didn’t want a sale. When sales levels were down, he would turn to his boss and blame the leads. In actual fact he wasn’t doing his job. David: Phone-call tracking is a missed opportunity. Most companies on their websites don’t bother with phone call tracking. That’s to their own demise. Even better if you can track a phone call to a completed sale. Michael: Exactly. What we found is when you begin tracking calls, you can report 80% more leads. And I would say that’s almost a low-ball figure. David: Could you for a moment explain WhatConverts? Michael: It’s sort of in the name. We look at what marketing sources convert to leads, quotes, and sales. So we do everything to make that happen. You can then qualify each lead. Is it quotable- yes or no? You can put in the quote value and the sales value. We do it on web forms, phone calls and on e-commerce transactions. We can tie every lead, quote and sale back to the original marketing resource. Each user has to qualify the lead manually and add some basic information. It’s just a one-click qualification- easy to do. For a little effort, it allows you to see the full value of your marketing efforts. David: Well, thank you so much for your time today. I really appreciate it.